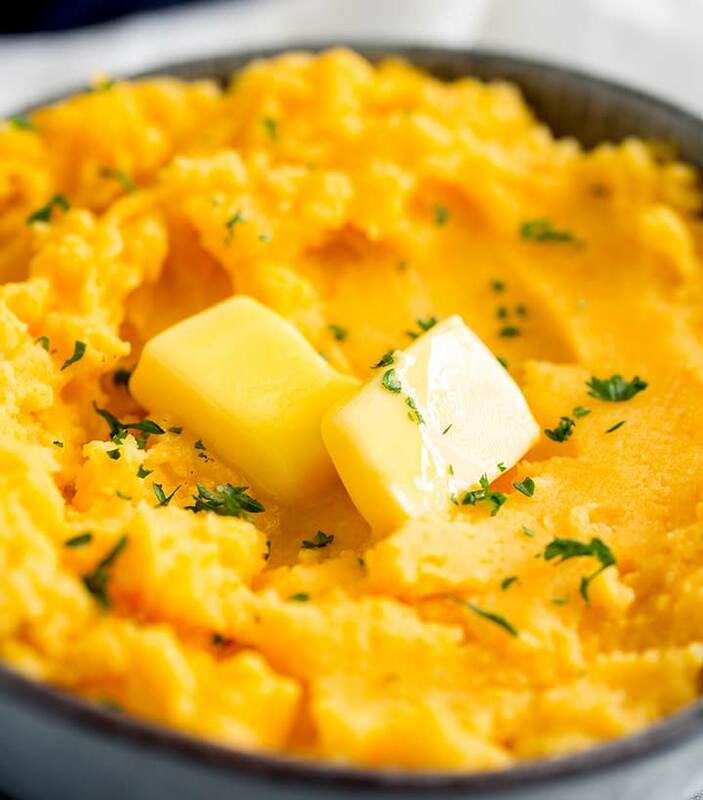 Learn how to make the BEST savory mashed sweet potatoes ever. They make a great healthy, low carb option perfect as a side dish for your midweek meal, as well as Easter, Thanksgiving or Christmas. 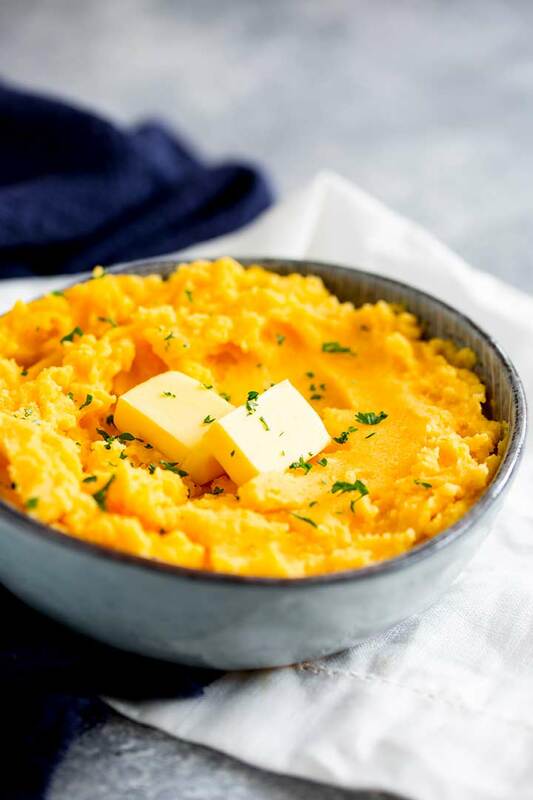 The boiled sweet potatoes are mashed until smooth and then mixed with butter and sour cream, to create an easy and quick side, that doesn’t take up oven space. Plus boiling them makes them extra soft, smooth and creamy. 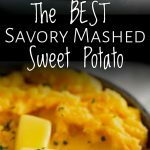 Mashed potatoes are a weekly occurrence in our house, they are one of the most loved side dishes! And rightly so, who can resist pillows of soft fluffy mash? 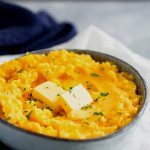 But as much as we all love mash, sometimes you want something a little healthier, with lower carbs and dare I say it something that fits into a diet! Stew is currently working on a Lower Carb diet, so amongst my favorite pasta recipes, I am going to bring in low carb recipes specifically for your partners who have decided to turn their backs on pasta and bread! So many recipes for Mashed Sweet Potatoes are made extra sweet, with brown sugar, maple syrup or marshmallows. Now don’t get me wrong I LOVE the maple syrup version, I even have one on my site with pecans. IT IS SO GOOD!!! You can see it here – Whipped Sweet Potatoes with Maple Pecans. But in the interest of low carb and also for those days when a savory mash is needed, I set aside the maple syrup and tried mashed sweet potato with sour cream instead. I can tell you guys, it was good. Lick the bowl clean good! The recipe starts with boiling the mashed potato in salted water until nice and tender. You can steam them if you like but this will take longer. Once the potatoes are fork tender they are mashed down and then mixed with sour cream, butter, and plenty of seasonings. Seasoning is so important in cooking, salt brings out the flavor of food and can change a dish from okay to great! All those delicious restaurant dishes you’ve tried, quite often the only difference to your home cooking is the chef’s use of salt during the cooking process. I suggest 1/2 tsp of salt for these potatoes, I actually like to add a little more to my plate, but most people find 1/2 teaspoon to be enough. And don’t forget the sweet potatoes were simmer in boiling water first so they have taken on some salt. Sweet potatoes are so much softer and less starchy than a regular potato so they are easier to mash. Use a Fork: This will give you a coarser mashed sweet potato. Use a Potato Masher: (preferred method) This gives great results and a wonderful smooth mash. 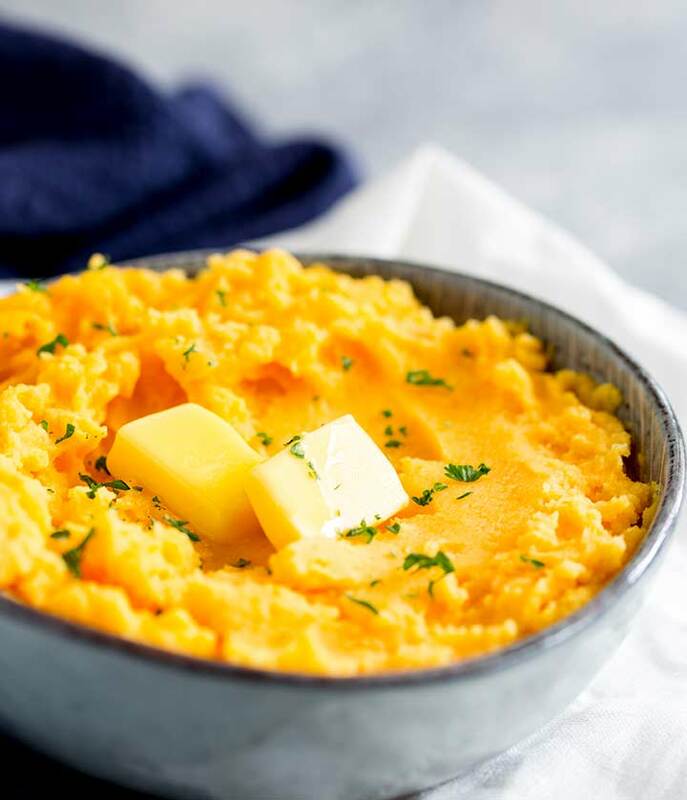 Use a Food Processor/mixer: Unlike standard potatoes, you can get a smooth mash from sweet potatoes in the food processor but be careful, just like standard potatoes they can turn gluey if you mix them for too long. To finish the dish, fresh parsley is added, this really helps to make the dish savory, as parsley has a wonderful, almost cut grass like taste. But there are several other herbs you can try. Add chopped fresh rosemary to the sweet potatoes as you boil them. Use fresh thyme instead of parsley. Use chives or green onions instead of parsley. How to heat up leftovers? Mashed Sweet Potatoes will keep well in the fridge for 4 days. Reheat the covered bowl them in the microwave, on 50% power. They taste almost as good as if you had made them fresh. Heat them until hot and steamy, but don’t overheat or the butter and sour cream will start to separate from the mash. If this happens, take a wooden spoon and mix them as vigorously as possible. 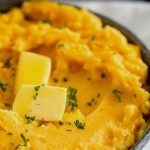 What to serve with mashed sweet potato? Pin this recipe for The Best Savory Mashed Sweet Potatoes. Pin it here. 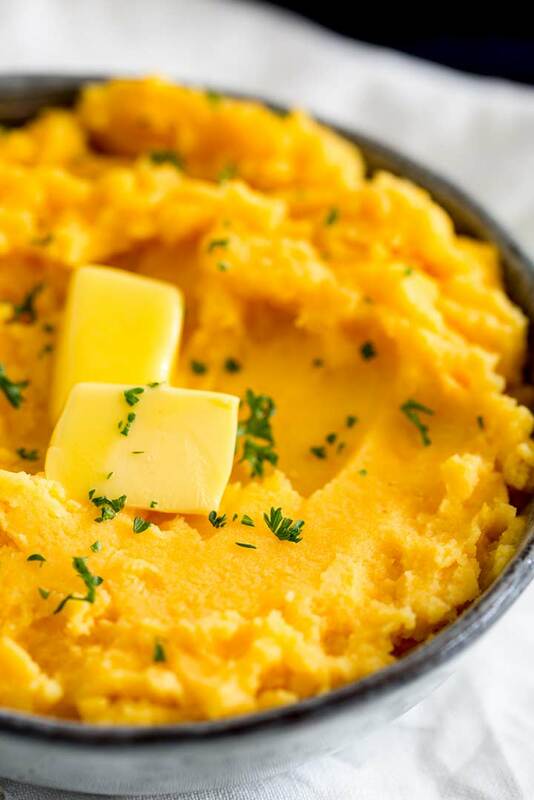 Learn how to make the BEST savory mashed sweet potatoes ever. They make a great healthy, low carb option perfect as a side dish for your midweek meal, as well as Easter, Thanksgiving or Christmas. 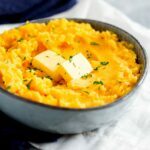 The boiled sweet potatoes are mashed until smooth and then mixed with butter and sour cream, to create an easy and quick side, that doesn’t take up oven space. Plus boiling them makes them extra soft, smooth and creamy. 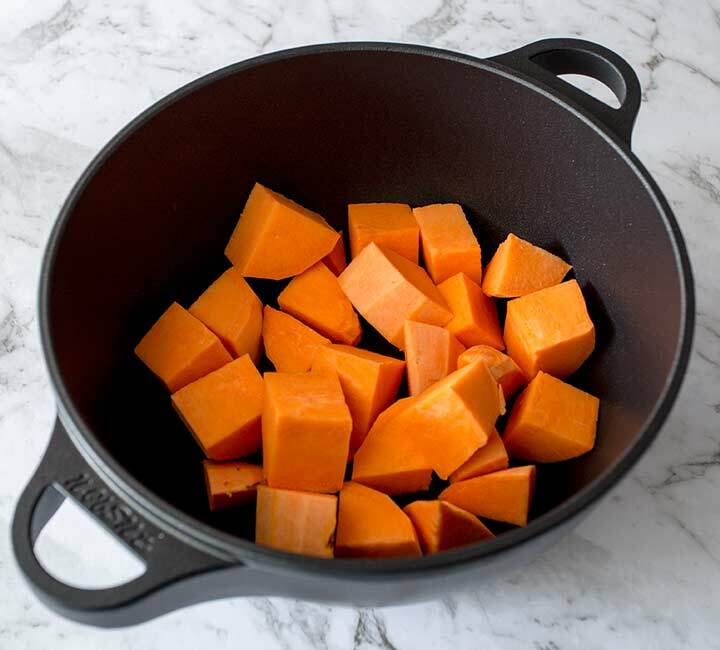 Peel and cut the sweet potatoes in to 1″ (2.5cm) cubes. Then place in a a large saucepan and cover with boiling water. Bring back to a boil, add a pinch of salt, then simmer for 15 minutes until tender. Drain well and then return potatoes to saucepan. Add in the butter, sour cream, salt, pepper, and most of the chopped parsley. Stir well to combine and melt the butter. Once mixed, serve with an extra slice of butter and the remaining chopped parsley. You can replace the sour cream with a low fat yogurt, but the results won’t be as creamy. If you were overly generous with the salt in your boiling water you may need slight less. I find most people use 1/2 tsp, but I like a little more. So taste your mash and add more as needed. Hi Claire! I love sweet potatoes and squash but I don’t like them sweet, I prefer savory. These would make a nice dish to serve with country ham or a lamb shoulder. Your recipes always make sense, they are straightforward and SO good! Thank you Dorothy, I think a country ham sounds like the perfect meat for this mash!!! !